Law enforcement officials investigate the scene of a shooting in a parking lot behind Colorado's dentist's office, June 14, 2018, in Westminster, Colo.
A 12-year-old boy told police he saw a driver open fire on his family during a road rage confrontation in Colorado, killing his older brother and critically wounding his mother and younger brother, authorities said Friday. Police arrested Jeremy Webster, 23, hours after the shooting that killed a 13-year-old boy and also wounded a bystander not related to the family. 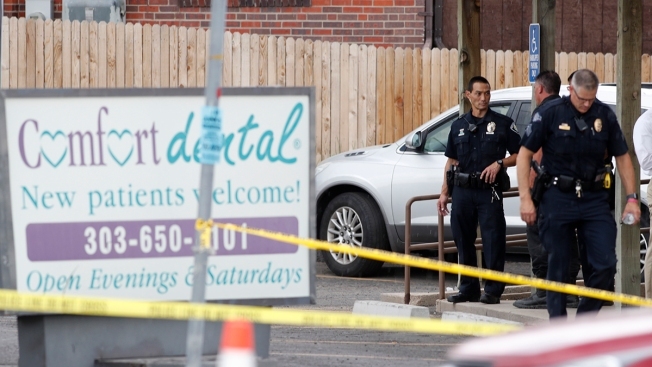 Webster acknowledged shooting four people in a suburban Denver parking lot and told officers he "has mental health issues," according to a search warrant, which did not specify his mental status. The 12-year-old, who was not injured, told police that his mother and another driver were involved "in some type of road rage incident" near a business complex in the city of Westminster. He said the driver followed the family's car into the parking lot and argued briefly with his mother before opening fire, according to the warrant filed in court Friday. Other witnesses told police that they saw Webster park his black Toyota Corolla behind the woman's vehicle in the middle of the lot. They said Webster shot the woman, then turned and shot two of her children "multiple times," according to the warrant. Police have not identified the victims. The mother, 41, and brother, 8, were in critical condition, while the bystander was less seriously wounded, authorities said. The man was shot while driving with his 9-year-old daughter in a pickup truck, but she was not hurt, the warrant said. The 12-year-old boy told police that his mother took a photo of the driver's license plate on her phone before they got out of the car. Authorities used the photo to look up the vehicle's owner and compared it to witness descriptions. Webster was arrested Thursday evening when police spotted his car traveling on a freeway near Colorado Springs. In the warrant to search Webster's car and home, Westminster Police Detective Matt Calhoon wrote that Webster agreed to speak with police. "Jeremy stated that he has mental health issues and just (started) a new prescribed medication today," the warrant said. "Jeremy admitted that he used his Glock 19 handgun to shoot the above people and that he secured the firearm in the trunk of his vehicle after the shooting." Webster faces charges of first-degree murder, first-degree assault and attempt to commit a felony. He is being held in jail without bond, according to online records. Jail records do not indicate if Webster has an attorney to speak on his behalf. Webster was born in New Jersey and does not have a criminal history in Colorado, according to court and law enforcement records. It's not clear how long he has lived in Colorado. He is due in court Monday.